we finished fitting every student and were, frankly, pretty high on the whole experience. Then I noticed Vy (pronounced "Vee"; my right hand and in the gold blouse above), Tuyết (pronounced "Twee"; of the Red Cross and in the red blouse above), and one of the principals talking rather animatedly with two 30-something women I'd never seen before. 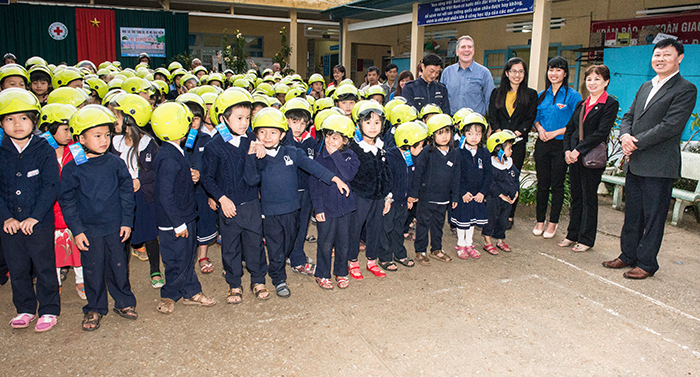 They called me over and, as Vy translated, one of the two women told me that they were "from the government" and needed to check to ensure that the helmets were safe for the children to wear. My brain screamed, "WHAT THE FCUK?" as I said, "These children had NO helmets two hours ago. Are you telling me that you think the top-quality Protec helmets I gave them, the best motorbike helmets for children that you can buy in Vietnam, might be worse than no helmets at all?" The response was something about they might be counterfeit helmets and that they had to test the helmets to ensure that they are genuine. —all things that Protec says on their web site prove that it's a genuine Protec helmet. The holographic seal on the back (see last photo above) is the indication of government approval. It says that the helmet meets May 2011 VN standards. If you look closely, you'll also see Protec's government-issues quality control number "QC0001" saying that they were the first company to get a QC rating. "We still need to test them." "They're probably not really from the government. "They are NOT leaving here with a single helmet! "This is going to be fun!!!" Outside my head, my voice said, "I'll call Protec right now and they will verify the helmets' authenticity for you." Even after getting Protec's verbal verification, the woman said (no surprise) that she would still need helmets to test AND that they might have to ask me to take the helmets from the children we just gave them to. At this point I told Vy to make absolutely sure that the women knew that she was only saying MY words and that nothing she translated came from her, It's one thing for a foreigner to mouth off to the government; they will most likely only deport me. If Vy mouths off to her (totalitarian) government, it could have a very negative effect on her immediate and/or distant future. I'm 61 and she's in her early 20's with a LOT more to lose, so make sure they know it's ME talking. Back to the two women (and out loud): "Really?! There are two ways you can take the children's brand new helmets away, because I will NOT do it. Your first option is that I will go to the podium and make an announcement that the government is here to take your new helmets away from you. Your second option is to stand outside the gate and take every helmet off the kids' heads as they pass through. Either way, I'll bet you don't make it home tonight without a visit to the hospital (implying that the parents would have a strong issue with two women not in uniform trying to take their child's helmet away. This is VN, where dog thieves often get beaten to death by the citizens unless the police arrive in time). They looked at each other and the speaking one said, "We'll let them keep them for now." Ahhhh... the un-offered door number 3... a good and wise choice. "But we're still going to need to take helmets with us to test." John: "Okay, no problem. What do you need?" Vy (whispering) to John: "You said you will never give any bribe, why are you telling them they can have helmets?" John to Vy: "Trust me. I know what I'm doing." John to the women: "What do you need?" Woman: "We need two size medium and two size small. We will bring them back to you within 24 hours." John (inside): "This is Viet Nam; there are NO RETURNS! If you were really testing them, you would want each size—small, medium, and adult." John (outside): "No problem... I just need a receipt signed by each of you saying that I am giving you four helmets for testing and that you will return them within 48 hours. I know you said 24 hours, and I want to make sure that you have all the time you need. I also need the receipt to say that if for any reason you do not return ALL FOUR of the helmets, you will pay me 5 million VN dong (~US$225)." Each woman's jaw dropped a little and they looked at each other. They probably make 5-7 million VND per month. I continued, "AND I'll need your government ID numbers on the receipt below your signatures." Vy smiled. She now knew what I was doing. The women briefly whispered to each other before announcing that they would not need to take any helmets tonight and that if they did need helmets to test, that they would get them directly from Protec. They then left rather quickly. John, Vy, and everyone watching (this is VN, so there were a LOT of people eavesdropping) smiled. The best part of the whole encounter was that EVERYONE who witnessed the interchange was in disbelief that I had said "NO!" to the government and was not in handcuffs and on my way to who knows where. I responded that I never said "no"; I said "yes, and..." If you tell someone, especially the government, "no", they are going to feel the need to fight you. If you tell them, "yes, and..." it puts them off their guard. If the women really needed helmets for testing, they would give me the requested receipt. Since I had a very strong feeling that they were really there to collect four helmets for themselves, my request for a receipt would never be granted. My "yes" to them had a better result than a "no" would have and it kept me from possibly saying "no" to a legitimate government request. The title of this blog is "Ali Baba and the four helmets" because in VN, thieves, criminals, and bad people are all referred to as "Ali Baba" with the emphasis on the last syllable of each word: Al-E Ba-BA. I don't think these women were really from the government—no one ever asked for or was offered an ID—they were definitely there to steal four helmets and therefore qualify in everyone's mind as Ali Baba. Numerous people even said so... after the women left. This encounter led to undercover cops attending the event at school 2—the first topic in my next post. I will also tell you why I have no photos of these two women and why I will no longer have anything to do with Tuyết or the Dalat Red Cross. Head run over by a truck? Khong sao! Please "Like" us and donate if and as much as you can... helmets are about $13 each and we need an order of at least 300 to get the special hi-vis color. I'm in Dalat. The donate link takes you to PayPal; the site says I'm in Tacoma, Washington, USA because that's where the bank account is. If you are in Vietnam and some other countries, you will not be able to use the donate link. Please go to http://www.paypal.com/, click on "Send money to friends or family" and use the email address LoveYourChildrenVN@gmail.com.